Hello and welcome to angel-art-and-gifts.com. This is where I tell you a little about this site. My name is Claudia and I'm the site webmaster. And as you may have guessed, I love all things angel. Why did I build this site? Why angels? I have been interested in spirituality (and angels in particular) my whole life. Angels have been part of my quest for inner peace. I have surrounded myself with angel-related stuff since I was very young. 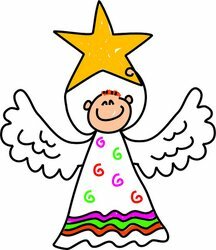 In an effort to deepen my understanding of angels, I have read books and magazines about angels, I have attended workshops on how to communicate with angels, and even built a collection of angel items. I truly believe in angels. I believe that they guide us and protect us. Even through difficult times, I find comfort in my belief. My friends know of my love of angels and know that I collect angel-related items. They’re always asking me where they can find angel-themed gifts. So I decided to build a site devoted to angels in general, and angel art and gifts in particular. It’s a one-stop site where they can find anything angel-related. I know that, like my friends, there are many people out there who also love angel-inspired art and who are looking for angel information. If you are one of them, I hope you find this site useful. You may see more Christian art, text and prayers throughout this site because of several factors, one of them being the availability of such works. However, this site is nondenominational in nature. I respect all religions, religious beliefs, and belief systems, and I do not claim to represent any particular group. Most images on this site come from the following sites: istockphoto.com, bigstockphoto.com, and dreamstime.com. I have acquired a standard license and permission to show these pictures on my site. The photographers/artists and the stock agencies mentioned before retain the copyright to such works. I have also used other pictures with the photographers' permission and such pictures are properly credited to the photographer who retains the copyright. In addition to these, you will find images from our affiliates. You can purchase these pictures by clicking on their links. Read our affiliate disclosure here. I hope you enjoy browsing and reading this site as much as I enjoyed building it. This is a work in progress, you will see many changes within the coming months as I grow this site. I've tried to be as accurate as possible, but to err is human. So if you see anything that needs correction, drop me a note using the form below. Also, if you would like to share ideas, comments, and suggestions, or have any questions, please feel free to contact me. I will never share your e-mail address with anyone.